Roger Federer is just one more victory away from becoming the oldest world No 1 ever after beating Philipp Kohlschreiber on Thursday. Federer, aged 36, won 7-6 7-5 in Rotterdam’s ABN Amro World Tennis Tournament in the last 16 and will achieve the historic ranking if he reaches the semi-finals. Andre Agassi is currently the oldest ever world No 1 and, with Rafael Nadal currently occupying that spot but not playing in Rotterdam, Federer is poised to take over. Federer was last the top-ranked player in 2012. Kohlschreiber, the world No 36, provided a stern test despite losing both sets and, in one stand-out moment, won a brilliant point with a no-look shot. 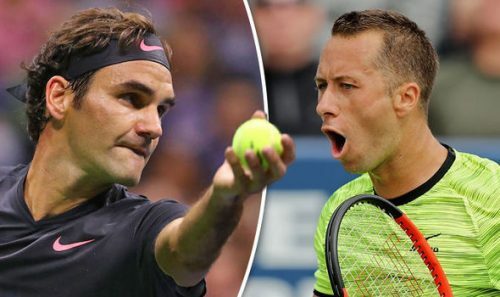 Federer was only able to break Kohlschreiber’s serve once but, when he did, it secured a 6-5 lead in the second set which he quickly turned into victory. Federer had taken the first set via a tie-break. Federer won the Australian Open in January and entered this week’s tournament as a wild card.